The concept of the World Cup is to bring together the world’s best athletes in a showcase event in prime locations. The 5th Wakeboard World Cup Singapore will be the 3rd stop of the 2008 World Cup series. 25 of the world’s top wakeboard athletes (19 men & 6 women) will be invited by the World Cup committee to participate in this event that will offer a USD60,000.00 cash purse. The Wakeboard World Cup Singapore 2008 will be the closing event for Waterfest 2008. Wakeboarding is a freestyle sport that has developed from surfing and waterskiing, with influences from skateboarding and snowboarding. Wakeboarding is the fastest growing water sport in the world with competitors performing flips, tricks, spins and a variety of other gravity-defying aerial stunts, sometimes as high as 20-feet in the air. A competitive free ride format will be used and riders will be judged on 3 style categories: Execution, Intensity and Composition. Riders will perform complex maneuvers off the boat's wake. After 4 years, the event moves downtown to Marina Reservoir where Singapore’s business district is located and where it’s first casino will be built. The route for the world’s first Formula One Grand Prix will go through this venue two weeks before. 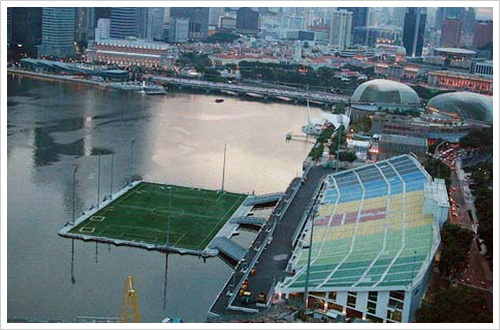 The Marina Bay Floating Stadium, also known as Marina Bay Floating Platform, is the world's first and largest floating stage. Made entirely of steel, the floating platform on Marina Bay measures 120 metres long and 83 metres wide, can bear up to 1,070 tonnes, equivalent to the total weight of 9,000 people, 200 tonnes of stage props and three 30-tonne military vehicles. The gallery at the stadium has a seating capacity of 30,000 people. Following Singapore's successful bid to host the inaugural 2010 Summer Youth Olympics, the Marina Bay Floating Stadium will be under the spotlight during the Games, having chosen as the venue for the Games' opening and closing ceremonies. FLOAT, presented by the Butter Factory, will be the 1st Hip Hop party on the water featuring the hottest DJ’s & Live Act’s from 7 countries! The event is targeted to start at 6:00 pm after the on-water activities end. The line-up will include DJs from Japan, Manila, China, Singapore, Malaysia, Hong Kong, and Emcees from around the region. Tickets are priced at $30 inclusive of 2 standard drinks. Event is only open to those 18 years and above. Wakeboarding using a mechanical winch, instead of a boat, on a man-made pool with a rail to perform various maneuvers. Riders & skaters will be judged based on Execution (level of perfection to which each maneuver on the rail is performed with a minimum number of falls), Intensity (the technical difficulty of the maneuvers executed) and Composition (reflects the rider’s ability to perform a variety of maneuvers). Participation is open to the public. The very first F3000 Power Boat Race in Singapore will have you on the edge of your seat as they travel up to speeds in excess 100 mph (160 kph). F3000 powerboats are single-seater light weight catamarans (about 400 kilos) with the ability to turn hard and fast in a single hard pin corner pulling in excess of 3Gs. These boats are powered by a 2.5 litre outboard engine that makes as much as 280hp and can accelerate from 0 – 100 kph in 3 seconds. Bossaball is a brand new sport that cleverly combines element of volleyball, soccer and acrobatics. It is played on a specially designed, portable and giant inflatable court fitted with large trampolines. Bossaball can be played by anyone for recreational purposes as well as for serious competitive sport. The height of the net can be adjusted to suit the players ability. Organised by Singapore Amateur Rowing Association (SARA) this competition, targets participants from primary schools, secondary schools and tertiary institutions. Winners of the competition will be awarded cash prizes and a challenge medals. Free rides for the public so everyone will have a chance to experience the the waters at Marina Bay. Free rides to the public wishing to keep their feet dry. Cash prizes will be awarded for the best Wakeboard World Cup moment. WaterFest Singapore 2008, the largest and most exciting water sports festival in Singapore, is back in town for the fourth year from 30 August to 12 October 2008. The festival, which encompasses local and international competitive, lifestyle and family events, aims to encourage and inspire Singaporeans to make water sports activities a part of their lives. For the first time, the public can enjoy more fun water events categorised under three different themes - WaterFest Family & Children, WaterFest Fashion & Lifestyle and WaterFest Extreme & Professional. There's something for everyone at WaterFest Singapore 2008. So, catch the wave and jump in! Please visit www.singaporesports.sg for more information. Total of 25 wakeboarding athletes from 17 countries: Australia, Belgium, Canada, China, France, Great Britain, Hong Kong, Italy, Korea, Netherlands, New Zealand, Singapore, South Africa and USA. The world’s best wakeboarding competitors performing flips, spins and other acrobatic stunts in the air, sometimes as high as 20-feet in the air. 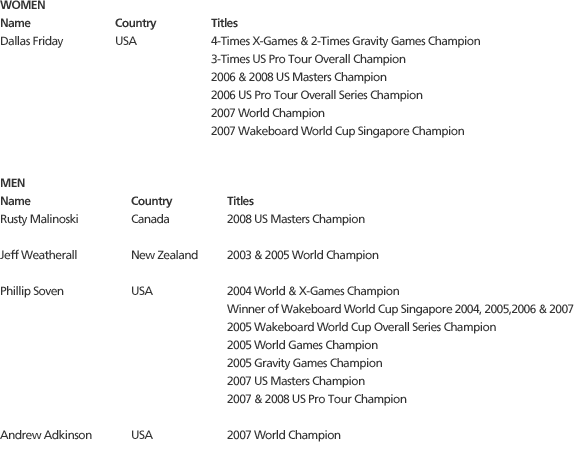 The top eight (8) ranked men and top four (4) women from the 2007 Wakeboard World Cup Series will be invited to compete. The current National Champions from Australia, Belgium, Canada, China, France, Great Britain, Hong Kong, Italy, Korea, Netherlands, New Zealand, Singapore, South Africa, and USA will also be invited to compete. People started wakeboarding for the first time in Singapore in 1991 when waterskiing was still the predominant towed watersport. But as waterways become populated and the calm water required for waterskiing became hard to find, wakeboarding began to become popular amongst water sports enthusiasts. Today, it has become the fastest growing watersport, increasing over 30 percent in participation over the past three years. According to a recent survey conducted by the Singapore Sports Council, wakeboarding is also the eighth most popular sport that Singaporeans want to pick up in the next six months and an estimated 50,000 Singaporeans have tried wakeboarding at least one time or another. In Singapore, wakeboarding has been supported by the Singapore Sports Council (SSC) which provides funding for top wakeboarding athletes to train and compete in international competitions such as the Asian Championships, World Games and World Championships. Sporting Association (NSA) and National Governing Body for the sport of waterskiing and wakeboarding in Singapore as recognized by the Singapore Sports Council and National Olympic Council. Registered in 1975, the SWWF has selected athletes to compete in the Wakeboard World Championships (2000, 2001, 2003 & 2004), Asian & Asian Australasian Wakeboard Championships (2002 & 2004) and 2001 World Games. On the domestic front, the SWWF organizes annual events such as Wakefest, National Inter-Varsity Wakeboarding Championships, Singapore Waterski & Wakeboard Open and Singapore Waterski & Wakeboard Nationals. 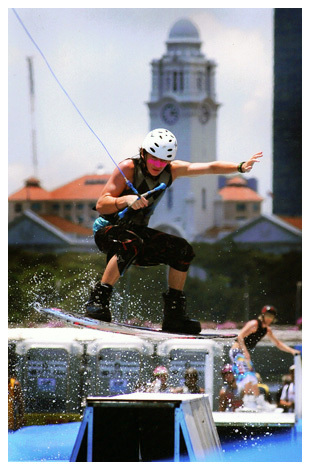 The first competitive wakeboarding event in Singapore was organised by the SWWF in 1994. 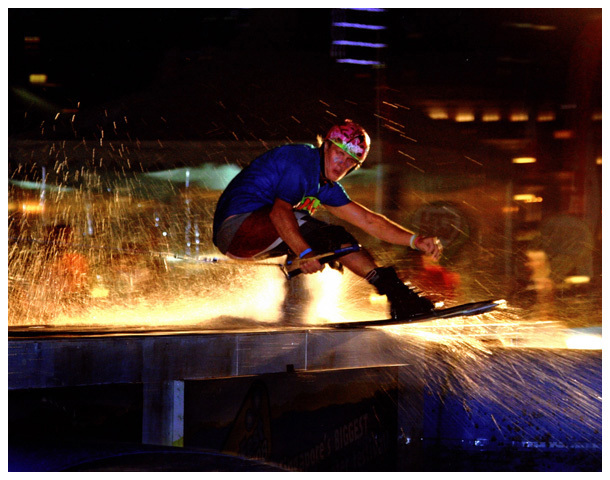 In 1996, the Singapore Waterski & Wakeboard Federation invited World Champion Wakeboarder Dean Lavelle to perform demonstrations in Singapore for the first time that paved the way for the sport’s popularity in Singapore. 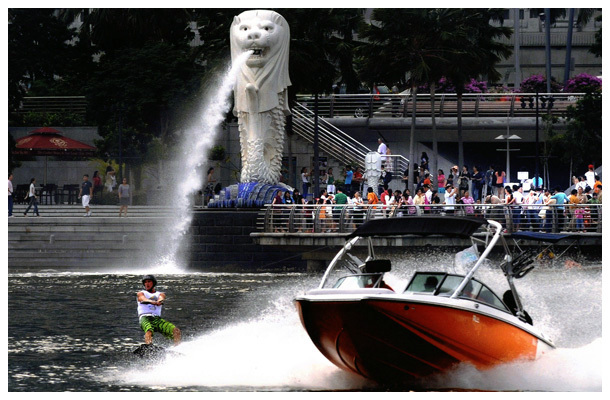 The SWWF has organized the Wakeboard World Cup in Singapore from 204 to 2007 at Bedok Reservoir. 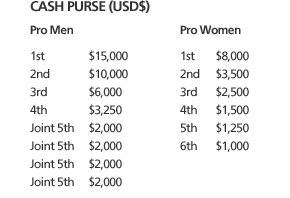 The International Water Ski Federation (IWSF) is the World Governing Body for Wakeboarding, as recognised by the International Olympic Council (IOC). © 2008 Singapore Waterski & Wakeboard Federation. All rights reserved.